So far I have cycled on the Route of Cheese, the Route of Flower Cities, the Route of Tourmalet, but today's route felt more like the Route de Cafe au lait. 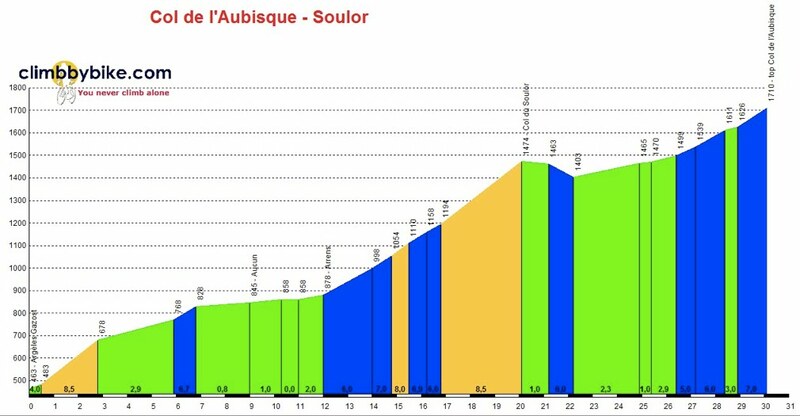 Shortly after my first cup (bowl) of coffee this morning I headed out the door to the 8% climb up the Col du Soulor. It was a quiet lazy morning climb, not too many climbers or cars by this point. Just your typical sheep in the road kind of ride. When you see these, you know you are almost at the top of the Col du Soulor. A lazy scene, even at the top. I found the top of the Col d'Aubisque somewhere in this heavy cloud. Still it was nice enough to sit out and enjoy a second coffee of the day at the Bar/Cafe at the top of the Col'dAubisque. 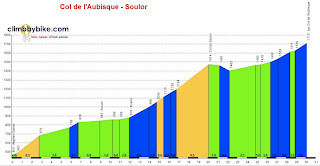 By now a large crowd had gathered as riders came up the Aubisque from Laruns, or across from the Soulor (my route). The men above were part of a group of cyclists with Pyractif. Pyractif offers guide services and accommodation for their clients in Bertren. I wish I could stay there too. These riders were on their way down the Col du Soulor and up the Col du Tourmalet. I met the tour guide operator and one of the riders, Frank Bowman who gave them rave reviews, admitting that he was typically a difficult customer. All the riders looked happy, fit, and well informed. I am a big believer in avoiding the super large bike tour companies. You will experience so much more of the true experience of cycling in France if you try to make it to France on your own and use the services of a smaller lodge or guide service. Velo Peloton (guest house and some tours) and Pyractif (tours) will even collect you from the nearby airports and train stations. I am so thrilled to be finding places like this in France that understand cyclists. I then met a very friendly group of hikers from Fort Collins, Colorado, USA. D&D live half of the year near Cahors and half of the year in France, how lucky are they? Next arrived John and John from the Nederlands. I again saw them down in the town of Arrens-Marsous and rode with them for a bit. It is not that I spent half the day at this cafe (although I could have), it is more that people tend to be happy and friendly when they are doing what they love to do. I finally got myself moving again, and had a cold descent into Eaux Bonnes and then turned around and came back up the Aubisque. 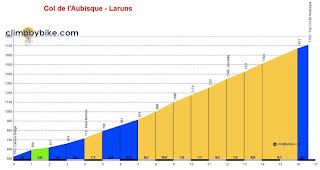 Yes, I like to climb, but I also appreciate the historical significance of these classic climbs of the Tour de France. I simply love being there. I love knowing every turn in my body, and in my mind, so that when I watch the stages of the Tour de France on TV, I honestly know what it feels like to be there. It feels awesome! Upon return to the Col d'Aubisque again, the clouds had really settled on the Col.
And then a return across to the Col du Soulor a second time (I could have ridden this road back and forth all day). When I descended the Col du Aubisque back to the Soulor, the fog was so thick I could hardly see 10 meters in front of me. I could hear cow bells all around me, but I could not see any cows. What an experience trying to descend and not knowing what I would come across. It felt so right being on this highway in the clouds today. Tonight pizza! Tomorrow I'm heading to the St Girons/Foix area. I'm on Vacation in France! My google blog page is now in Spanish! 2010 Tour de France begins today!